Today, to celebrate the opening of Broadway Bites, our 34th Street archivist Anne Kumer shares some dining history of the district. This post also appears on NYC Circa. For many years a Choc Full o' Nuts lunch counter occupied retail space in the ground floor of the Hotel McAlpin, now, Herald Towers building, at 34th and Broadway. Like most restaurants in Midtown Manhattan, it was packed around lunchtime. December 1954, Alfred Eisenstaedt. Photo: LIFE via this blog post. Choc Full o' Nuts opened its first store near Times Square at Broadway and 43rd Street, in 1926. The company continued to grow, opening its first cafe opened in 1932, and following with food trucks. The company's founder was William Black, who, as his business grew, also became a well respected philanthropist. He donated a lot of money towards medical research, and in 1957 founded the Parkinson's Disease Foundation with an initial donation of $100,000. 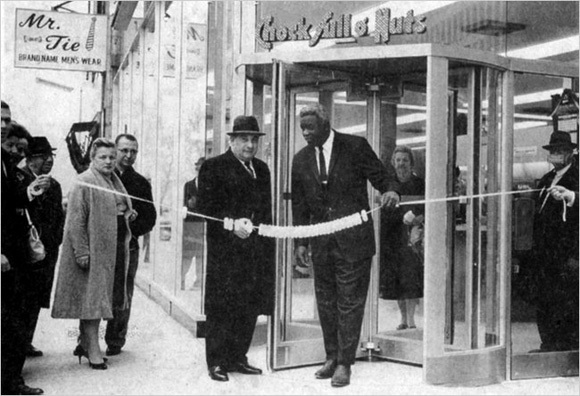 One of Choc's most well known employees was famed baseball player Jackie Robinson. Shortly after retiring from baseball in 1956, he was hired as the company's Vice President and Director of Personnel. Mr. Robinson was an extremely vocal Civil Rights advocate as well. NARA has a great collection of his letters. The comments section of this post by Ephemeral New York includes many fond memories of the franchise in the city. For a while, Choc Full o' Nuts at 34th Street and Woolworth's supplied Midtown workers with two solid lunch options flanking Herald Square. The 34th Street lunch counter closed in 1990. Where do you go to get an Egg Cream now? DSW Shoe of the Week: Superman Kicks! Coming to Greeley Square Park: Nuchas!